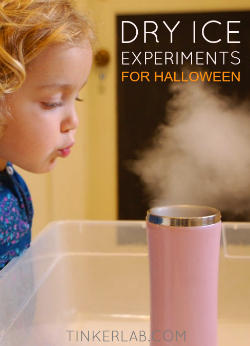 Dry ice is a favorite mysterious Halloween material, perfect for spooking up a witch’s cauldron, but did you know that you can experiment with it too? Dry ice is so cool (couldn’t resist! ), and makes for a fantastic (ventilated) kitchen or outdoor experiment. Have you ever worked with it? The big caution is that you don’t want to touch it less it burns your skin. Got that? So it has to be handled with tongs and/or insulated gloves. Read up on the cautions of using dry ice before proceeding, and always use your best judgment. I went through all the warnings with N, and the dry ice earned a great deal of her respect. 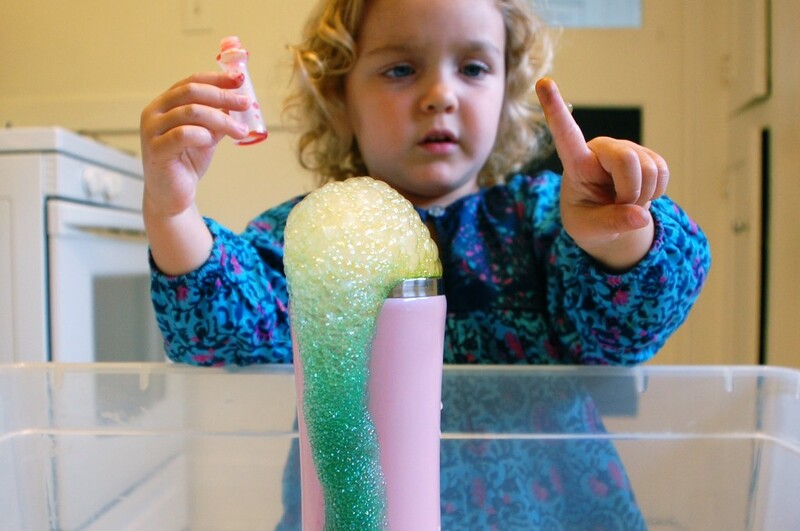 She kept asking questions about how ice could burn us (it wouldn’t make sense to me either if I were her age), and was very curious about how it “smoked” on its way from our porch to the kitchen. In case you’re wondering, I think it’s smart to introduce kids to “dangerous” things. They’re naturally curious about how the world operates, and given the proper instructions and parameters these introductions can give them a good foundation for critical and creative thinking. Have you heard of the The Dangerous Book for Boys or The Daring Book for Girls? I have a copy of the latter that I know N will love when she gets to be a bit older. I found the dry ice at our supermarket, and asked the manager to help me pack it up. They come in big bags (perfect for cooling a fridge full of food, but far too much for this experiment), and I understand that they may break smaller pieces for sale…it sells by the pound at our market. To do this experiment, we used two pieces, each the size of a button mushroom. I filled the bottom of this metal travel mug with about a cup of warm water, and dropped a piece of dry ice in with kitchen tongs. The ice makes a surprising sound when handled by the tongs! The smoke is perfectly okay to touch. Then we got fancy. N squeezed some dish soap into the mug. And it got even more exciting with the addition of red food coloring. And green, blue, and yellow food colorings, too! 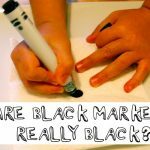 This project is great for encouraging curiosity, setting the groundwork for scientific investigation (observation and experimentation), and building creative confidence. A+ in my book! 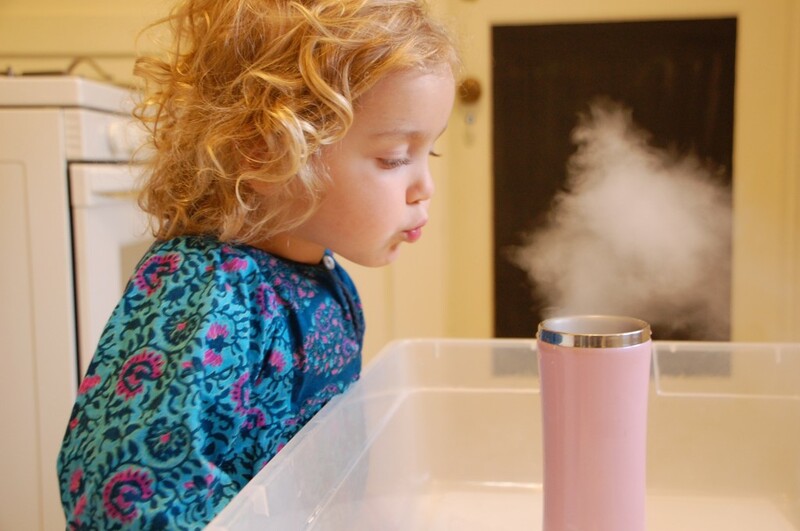 Dry Ice is frozen carbon dioxide, which dissipates into carbon dioxide gas when it melts. It’s called Dry Ice because it turns directly into a gas from its solid state, without ever becoming a liquid, and therefore there’s no puddle of water in its melted state. This process is called sublimation. Also, Steve Spangler Science is my new best friend, and it’s where I gleaned tons of good information for this post. 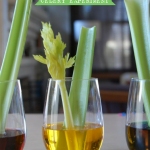 If you like science experiments, do check this out. 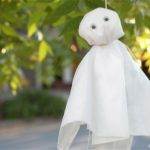 Get more Halloween ideas on my Halloween Pinterest Board. 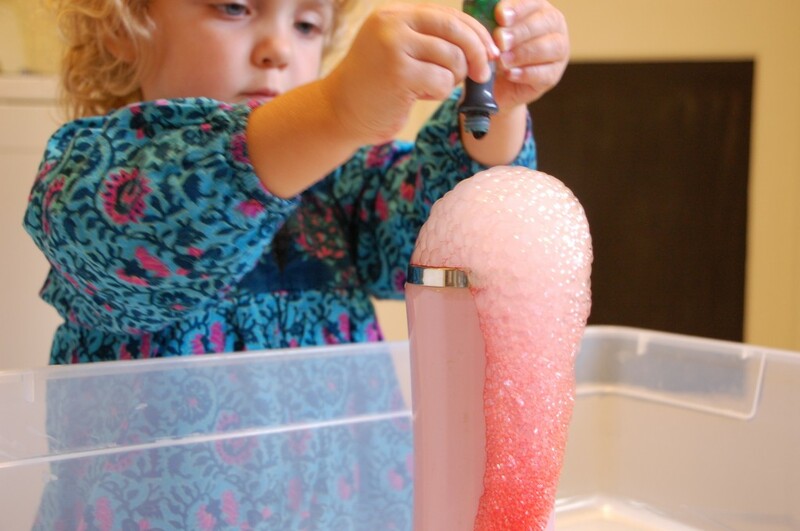 If you enjoyed this post, follow us on Facebook for more child-centered experiments and explorations. Draw Shape Monsters: Each one is different! Another wonderful post!! Love the little additions you did… Dry ice is putti’s favorite to watch when she visits her dad’s lab (he is a post doc working on grapes and peanuts). I should really try this … Thanks for inspiring as always !! Putti is a lucky girl! And thank you for the nice comment, Roopa. So appreciated! We have both books and my kids love them! Did you know there are american and british versions- got mine on ebay. I had no idea, Deanna. Do you have any idea how they differ? I’d love to know!! Great! C would love this! She would ask me questions galore!!! (not that she doesn’t ask enough questions already!!!) We’ll have to get some dry ice! Thanks for the tips about the dangers! It is always a surprise what you will post!!! So funny that you mention Steve Spangler. We just ordered stuff from him 2 days ago for a birthday present. He has some awesome stuff there. Also, when we ordered our Omaha steaks they came packed in dry ice. So much fun to play with and we were able to just leave them in the cooler they came in so we did not have to even handle them. On a side note, is there any way to search your blog? 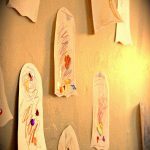 I am looking for the post from a mom blogger out there on Drip paintings from a few weeks ago and I can’t remember where I saw it. Hi Sarah! I recently found the SS site, and I LOVE it. The child you got the birthday gift for is super lucky! Ugh, my current theme doesn’t have a search function, and you’re the third person to ask me about this in the past week. I like the design of my site, but I think it’s time to change things up and make it more functional. Thanks for bringing this to my attention 🙂 In the meantime you could do a Google search on “drip paintings tinkerlab” and see if what comes up is what you’re looking for. This looks fantastic!!! Love it!! 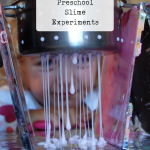 What fun this must have been for the little one to observe the various aspects of this experiment! Even adults would be thrilled to see something like this. The Steve Spangler site is a great inspiration for us too. Pari often visits that site with me to see videos..! 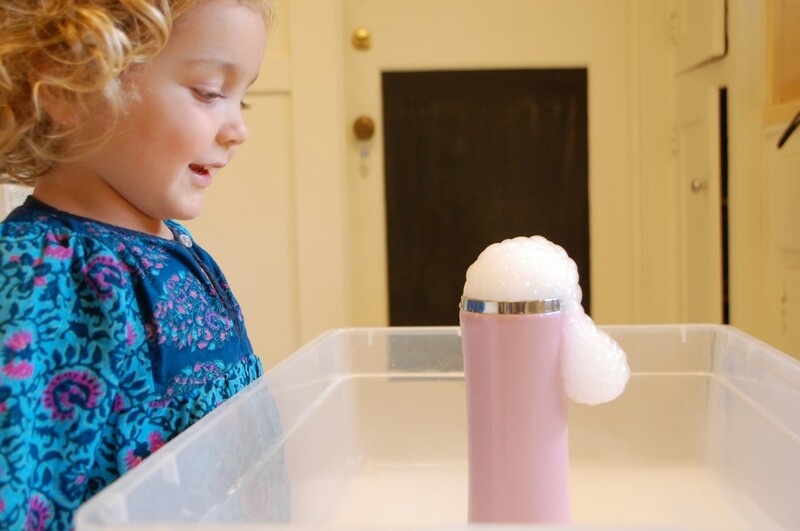 Dry ice is lots of fun to play with 🙂 It looks like your daughter had a great time with this. If you want to try something else with dry ice you can use it to make a sinking balloon. 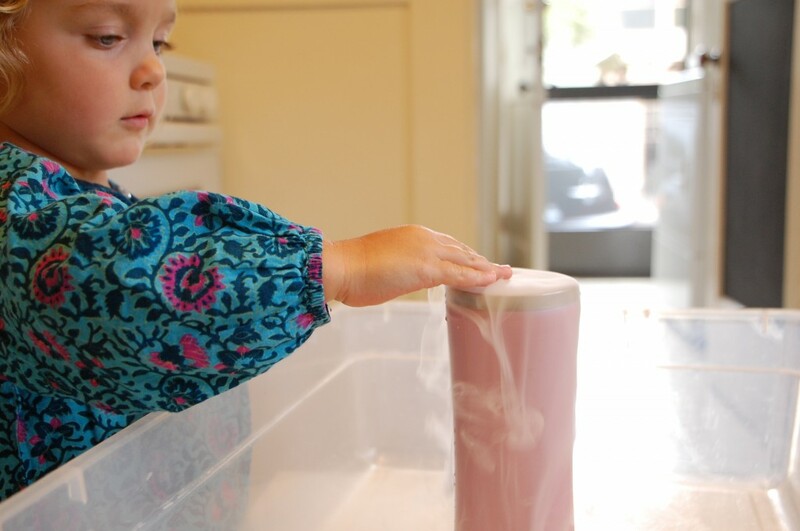 You need to put a piece of dry ice in the bottom of a container with a narrow neck. 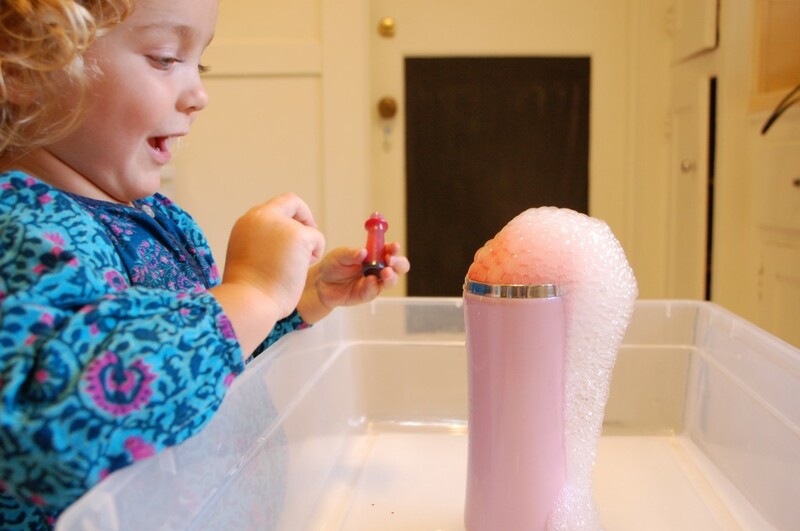 Then you stretch a balloon over the neck of the container and it will fill up with carbon dioxide. This balloon will always sink as the carbon dioxide is heavier than the surrounding air. Lots of fun to experiment with and an interesting contrast to a normal balloon. Oh, great ideas! 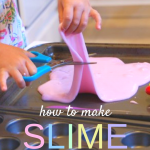 Not only did I like the blog post (extra fun adding the food coloring! ), but the comment about the sinking balloon is perfect for my group. Perhaps I’ll do a section on balloons filled with helium, helium/oxygen mix, oxygen only and carbon dioxide. I’ll have to search out more ideas for dry ice demos. Thanks! 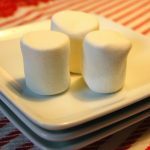 very good post for Dry Ice ExperimentÂ http://dryiceexperiments.org Thanks for all of your time & work. I work in a research lab, and routinely get shipments on dry ice. Needless to say, I have lost a lot of caution where it’s concerned. Rules when I bring it home for playing withÂ are, “Don’t hold it for long,” “Never hold it in your fist,” and above all, “Don’t put it inÂ a sealed container.” Oh, and use in a well ventilated place, like a big open kitchen. 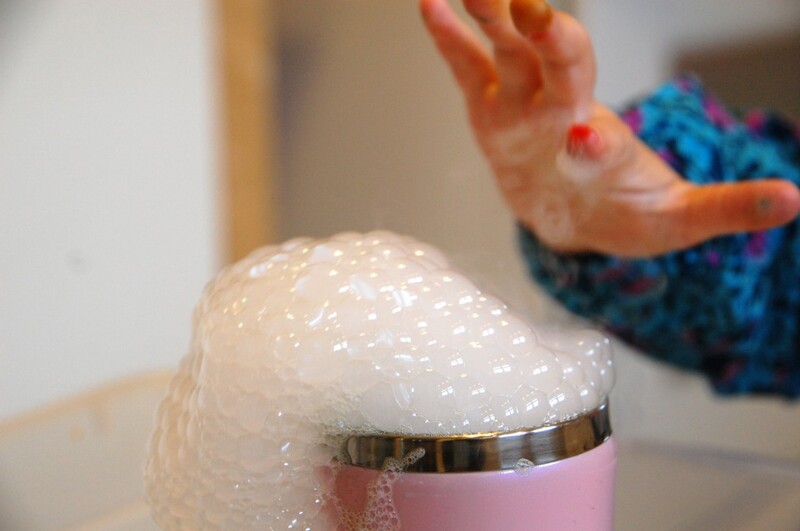 I’ve never done the sinking baloon trick – should get more dry ice this week, will try it! That is *so* cool. Now where can I buy dry ice from in the UK? I’m not sure exactly, but we get ours at a grocery store. They sometimes sell it so that people can save food if their fridge is down or if they’re traveling long distances. It might be worth calling around. Another thought is a fishmonger. I came across this post on Pinterest, and we gave it a try the other day. 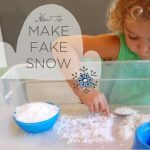 I shared bits of our experience here: http://simple-whimsy.blogspot.com/2012/05/dry-ice-is-cooooool.html with a link back to you. Thanks for sharing! This was fun! Rachelle – So Fun!! We are so glad TinkerLab is our new best friend too. 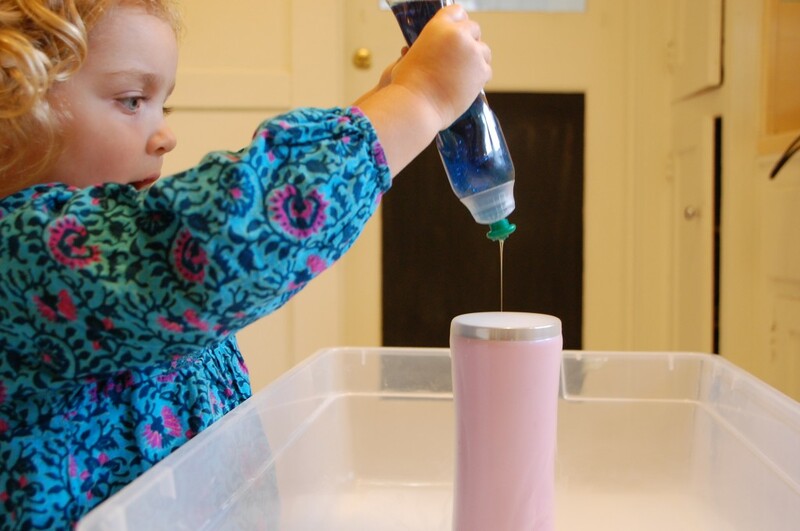 What a great idea to use the mug to protect little hands and insulate! Thanks for the comment, Susan! I’m lucky to know you too!